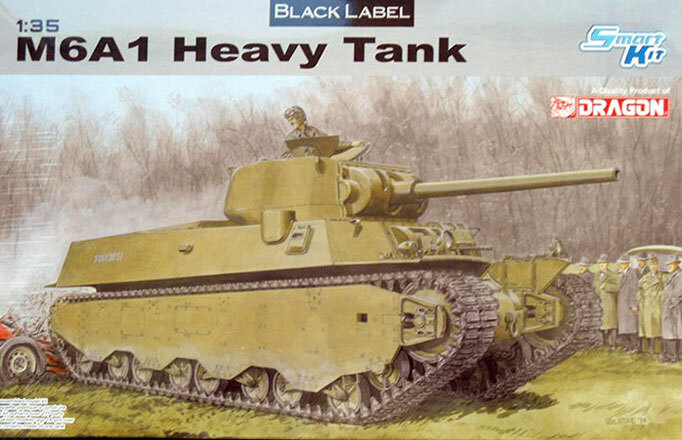 In May 1940 the US Army contracted with Baldwin Locomotive Company to build the first US heavy tank since the Mark VIII International of 20 years earlier. The new tank was based on WWI thinking with only a few changes, and as such had a large and bulky hull design with a turret mounting both a 3" main gun and a 37mm antitank gun along with a .50 caliber machine gun at the rear and one on a flexible mounting. Two more moveable .50 caliber machine guns were mounted in the bow to the left of the driver and the driver himself had a pair of semi-fixed .30 caliber machine guns pointed forward (later reduced to one on the right). At the AMPS 2012 show I noted that Commander Models had a new kit of the M6A1 on sale, so I picked it up and built it. It was a “craftsman” kit which means you have to supply a number of the parts yourself and also need to fill in the “blank spots” on the kit. It took me about 150 hours but I completed the model, warts and all. Needless to say when DML announced a new mold kit in styrene, I was ecstatic. Sadly, that seems to have been premature as the DML kit has retained a number of the flaws from the Commander kit. First and foremost is that the tracks are too wide. 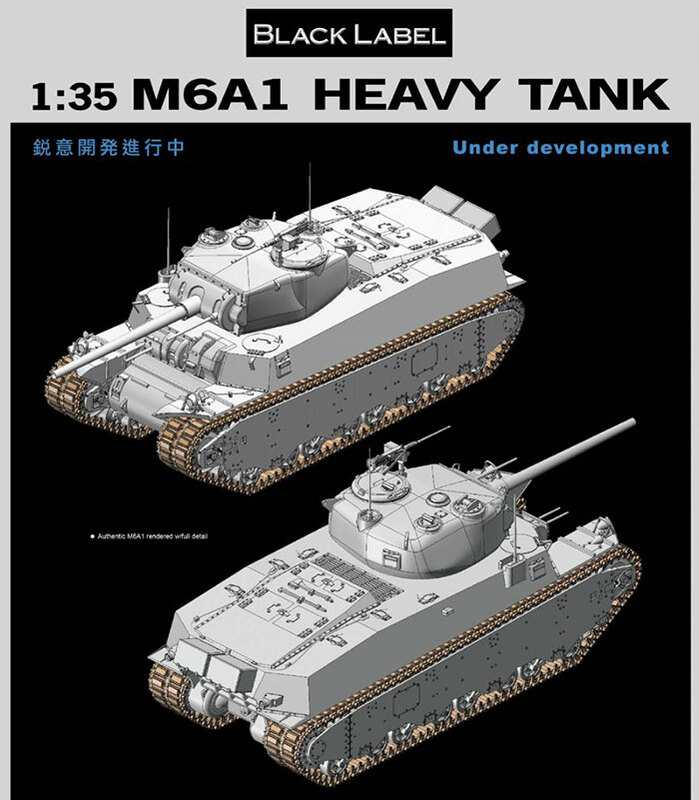 The actual tank had tracks listed as 25.75" wide or 18.7mm in 1/35 scale. The ones on the Commander kit worked out to 30" as per the instructions using two sets of after-market T49 tracks or 21.7 mm. The tracks on this kit - while newly molded as noted – are also 21.7mm. This is a shame, as the kit DOES have the proper road wheel design and very nice bogies; why DML would get that right and then get the tracks over four inches too wide is beyond me. Oddly the CAD drawings show the rear access hatches as separate parts but the hull top is molded with them closed. Likewise the hull grating, which the manual shows was not given a protective liner (like later ones based on combat in Europe) and the engine could be seen through the grill; no interior other than the main gun assembly is provided. It took me about two weeks of looking and checking and finally using a high grade image run through Photoshop Elements to see how the exhausts were mounted in the tank. The upper bar on the outside cells of the grill was removed and two trumpet-shaped exhaust horns projected down into the exhaust bay. The kit provides the complete grill and no exhaust tips. It does come with the HF antenna mount for command tanks properly molded and this attaches to the upper forward section of the hull. Commander used the preserved M6 which had this assembly welded up and sealed off. However, the .30 caliber tripod on the front right fender is missing. Also while the port is provided for the single .30 caliber gun remaining after testing (on the right front of the bow plate) no barrel is provided. The model comes with a small sheet of decals from Cartograf but these are basically “number jungle” types for the serial numbers. The one on the model - USA 3014361 – is that for the first production prototype; note that it was separated by commas in the peculiar style seen on some early war tanks (e.g. 3,014,361). This vehicle appears to have used white, but the others seem to have used blue drab. Overall, this is a bit of a disappointment as DML did good things like fix the suspension problems and then provided the kit with oversized tracks. But if you want one, this is the place to start as it is a much easier build and being styrene easier to correct.